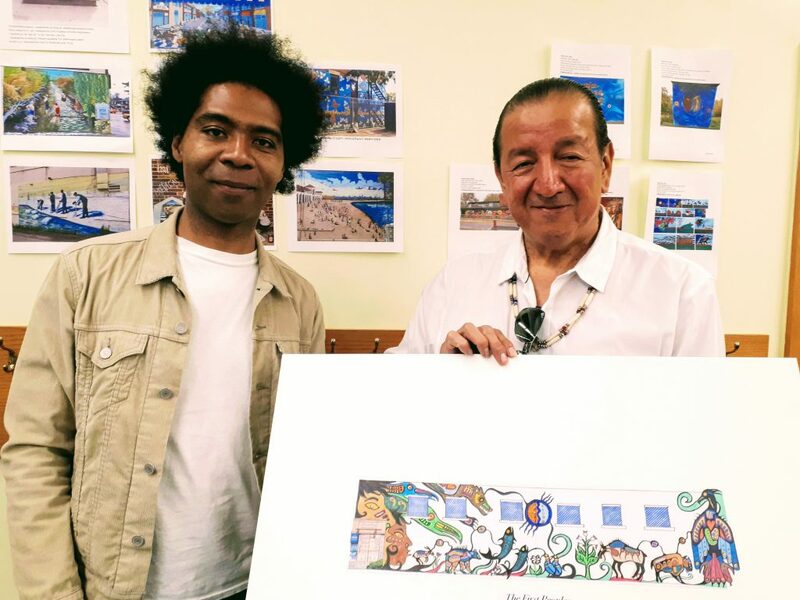 In partnership with StreetARToronto (StART), the Roncesvalles Village BIA commissioned lead artist Philip Cote and local artist Jim Thierry Bravo to design a mural for Roncesvalles Village at 149 Roncesvalles. Mural at Garden and Roncesvalles. Drone shot by Rodrigo Ardiles. 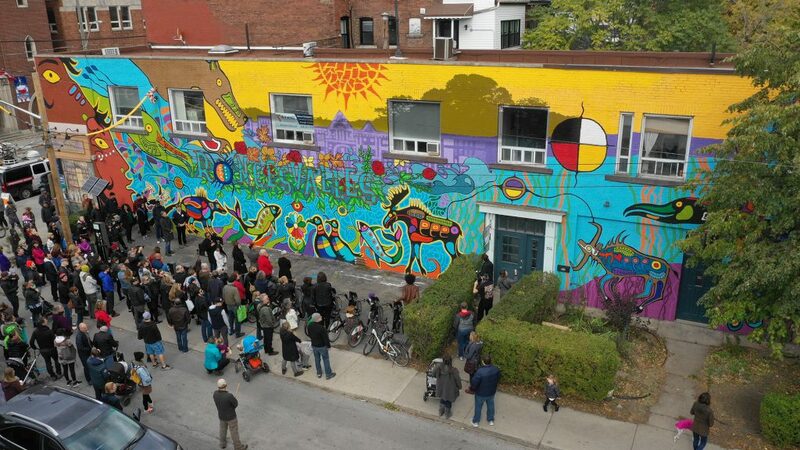 Entitled The First Peoples Leading to the Eighth Fire, the mural presents the stories of the indigenous peoples who first walked the land where Roncesvalles Village now stands. A few local buildings from the last century emerge from the word ‘Roncesvalles’ which is heavily intertwined with foliage. Some tree elements are being added. Integrated into the wordmark is a symbol for The Eighth Fire. Philip Cote and Jim Thierry Bravo bring together the sensibilities of a First Nations artist with those of a first generation Canadian artist. Bravo’s family immigrated to Canada in 1985 and settled in Toronto when he was young. 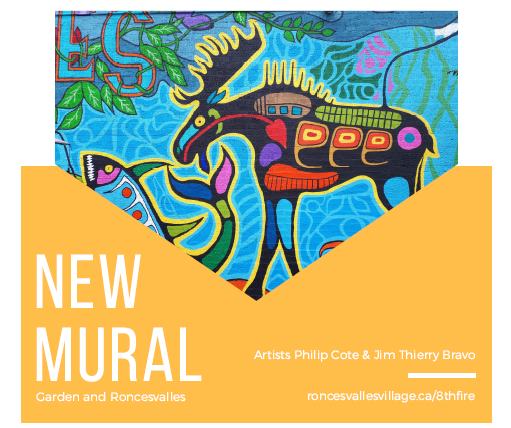 Both have lived on Roncesvalles Avenue and are well known mural artists in this City. They have witnessed how the neighbourhood has changed in the past 30 years. Jim Thierry Bravo and Phil Cote during the third community consultation on June 9, 2018. Links to audio files of Philip Cote sharing some of the stories behind the characters and symbols in the mural will be published on this page in November 2018. The wall is 24′ high by 106′ wide and faces south onto Garden Avenue at Roncesvalles. It is on the south wall of the building at 149 Roncesvalles parallel to the Bike Share station. First we want to thank the artists Philip Cote and Jim Bravo for their inspiration and hard work during an extraordinarily hot summer. Thank you also to the creative support team: Nelly Torossian and apprentices Fatima Ammari and Emmanuel Taylor. Thank you to those documenting the process: Sanjay Parker who is producing a video and audio files, Rodrigo Ardiles for his drone camera work and Ted Best for still photography. Thank you to the Roncesvalles Village BIA Street Art Advisory Committee: Ellen Moorhouse of Back Lane Studios, Gillian Bacher of Jewel Envy, Adam Langley of Guardian and Solarski Pharmacies, Len McAuley of Pollocks Home Hardware, and community members Alexis Victor and Alison Cooley, for your insightful guidance. Thank you to Catherine Campbell of StART and to Mayor Tory for all your help. 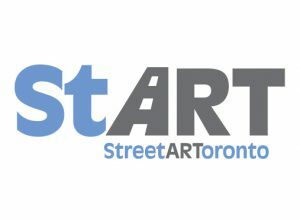 We gratefully acknowledge the support of StreetARToronto (StART) and the City of Toronto, and from our local businesses Solarski Pharmacy and Pollocks Home Hardware.